The last entry in the series on Timberline Smokehouse is this Tequila Jalapeno variety. See my other reviews of their Beer & Fire, Sweet Bourbon & Honey Pepper, Sweet Mountain Barbecue, Beer & Garlic, and Original. Adam Thomas, founder of Timberline Smokehouse, is also the owner of Thomas Smoked Meats, both based in Johnstown, PA. Thomas originally offered his jerky in 1998 under the Thomas Smoked Meats brand, which he continues to do today. In 2008, he decided to take his line of beef jerky national, under the Timberline Smokehouse brand. Both brands utilize the same recipe. This "Tequila Jalapeno" variety is described by the company as having a full jalapeno flavor with a shot of tequila to make a "tender cut with a kick". Beef, water, corn syrup, dehydrated jalapeno peppers, seasoning, salt, dehydrated garlic, paprika, monosodium glutamate, tequila, sodium nitrite. The first thing I taste from the surface of these pieces is a jalapeno flavor, followed by a light saltiness. A light spicy burn is building in the back of my mouth. Overall, a moderate flavor intensity on the surface. The chewing flavor is largely the same as the surface flavor, with only a touch of meat flavor. For being dubbed a "Tequila Jalapeno" variety, I don't really notice any tequila flavor. At least, it doesn't have any flavor that resembles tequila. If there's any of that fermented agave flavor, perhaps a tequila aficionado might find it. But as for the jalapeno, there's plenty of flavor. It has the flavor of raw jalapenos as opposed to the pickled variety. It's the first flavor I noticed when putting a piece into my mouth, and it continues throughout the chewing. After several pieces, the flavor tends to get lost in the saltiness and burn, so pausing for a moment with a swig of water helps regain that full flavor. And as for the burn, there's some. I'd rate it on my hot scale as a medium, both on an individual piece, and after eating several pieces. The saltiness seems to be moderate in intensity. I don't really taste as much of the natural meat flavors in this variety as I did in the other varieties from Timberline Smokehouse. I evaluated a more fresh batch of jerky sent to me from the company, as well as an older batch that they sent to me earlier, and both are the same. But I can taste a faint garlic flavor back there. Overall, what you'll notice the most in this is the jalapeno pepper flavor and a medium level jalapeno burn. After that, a moderate amount of saltiness, and very light garlic and meat flavor. But no tequila flavor. These are slices of whole meat, sliced medium to thick, and in small pieces. 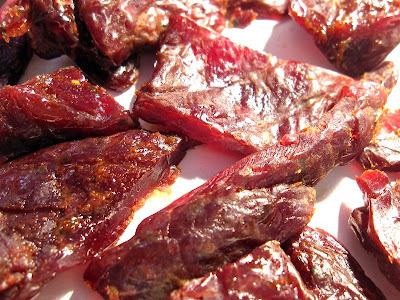 This is a moist jerky, with a lot of moisture and oiliness on the surface. These pieces seem easy to bite off into chunks, and seems to easy to chew. The chewing texture starts out feeling soft and moist, and quickly breaks down with a little bit of biting. It chews down to a soft mass easily enough and at that point feels just like chewing a piece of steak. I don't see any visible chunks or streaks of fat, however, I did encounter some unchewable wads of tissue on some pieces. Others I found to be pure meat. In terms of clean eating, these pieces are somewhat oily on the surface. Some more than others, and occasionally requiring a finger licking and jeans wiping. Timberline Smokehouse sells this Tequila Jalapeno variety at a price of $9.00 for three 1.75oz packages. If you spend more than $25.00, the shipping is free. I bought $36.00 worth, encompassing several of their varieties. That works out to a price of $1.71 per ounce. 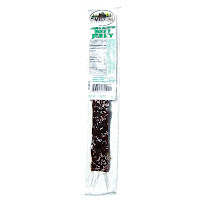 For general jerky snacking purposes, at the $1.71 price per ounce, this Tequila Jalapeno jerky presents a good value. I'm getting a good deal of snackability from its good overall flavor, moist easy eating, and good chewing texture. The $1.71 price per ounce is the same as what you'd pay for the mass-market brands at the grocery store, but you're getting a better jerky out of it. As a Tequila Jalapeno variety, at the same $1.71 price per ounce, it's decent value. I'm getting a lot of jalapeno flavor, and some jalapeno heat, but I'm not really getting any tequila flavor, or any kind of tequila characteristic. But at least for the jalapeno part, I think you'll get enough jalapeno flavor for that price. 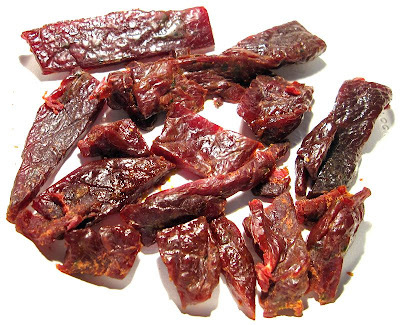 This Tequila Jalapeno variety from Timberline Smokehouse provides a good deal of jalapeno flavor and a moderate amount of burn, creating an enjoyable jerky experience for jalapeno pepper lovers. I don't necessarily taste any tequila in this, or anything that has a tequila charateristic, but then again adding any more tequila to this would probably make it cost-prohibitive. 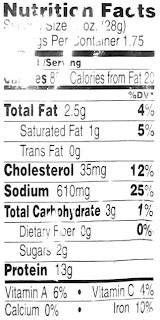 But a jalapeno flavored jerky is largely what this is. After that, I only pick up some saltiness, and some faint meat flavors and garlic. Otherwise, it has the same moist soft meat consistency that the other Timberline Smokehouse varieties have, and the same steak-like chewing texture. Compared to other jalapeno beef jerky varieties I've had it's good. I didn't give it a higher rating because I didn't get that "wow" factor from it. But if you love jalapeno beef jerky, I'd certainly recommend it. A good beer pairing for this would be a porter.